We're a fun-loving community of boaters of all skill levels and ages who love our rivers! 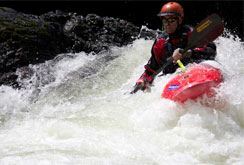 Founded in 1954 and now with over 500 active members, Colorado Whitewater (also known simply as "CW") is one of the oldest and largest whitewater clubs in the country. Run 100% by volunteers, Colorado Whitewater is a nonprofit organization that promotes the sport of whitewater kayaking in the Rocky Mountain region. We introduce new kayakers to whitewater, teach paddling techniques, promote and teach whitewater safety, and support racing and freestyle kayak competitions. In addition, our mission is to inform the public about river access, conservation, and other general issues concerning rivers and wilderness, while working to resolve problems related to those issues. Most or our members explore the rivers in hard-shell kayaks, but some use inflatable kayaks, stand-up paddle boards, and many also own rafts so they can support overnight camping trips on the river and/or bring their family along. We're the club where you'll feel welcome. Join CW today! Learn more about the history of Colorado Whitewater. New to kayaking? Sign up for one of our kayak classes.